Infant educator Magda Gerber Said: ‘If you can learn to struggle you can learn to live’. Easier said than done? Surely. But why? Struggle is an integral part of our lives, and if we can learn to deal with it, if we can learn to cope, we can learn to live to the fullest. It’s not bad. It’s not good. It just is. The fascinating thing about struggle is that we have come to believe that it comes in degrees, and it only ever comes in the intensity we can handle… well, usually. Right now we are observing our tiny baby daughters taking first steps (no, no, not literally – not yet!) in the world filled with struggle. We are looking at them deal with their frustrations, as they learn new skills, master new movements, notice new things. Learning comes with struggle, but if we protect our babies from the daily struggle from the very beginning, we might be doing what the man in the butterfly story did – we might be preventing them from experiencing the degree of struggle that is necessary for them now to be able to fly later. Learning to struggle is the first real experience of learning to deal with frustration, emotions, fears and anxieties. The first opportunity to live life to the fullest, with all its ups and downs, floors and blankets, bruises and laughs. What better way to learn to struggle than in a safe place, with our beloved mum or dad nearby? 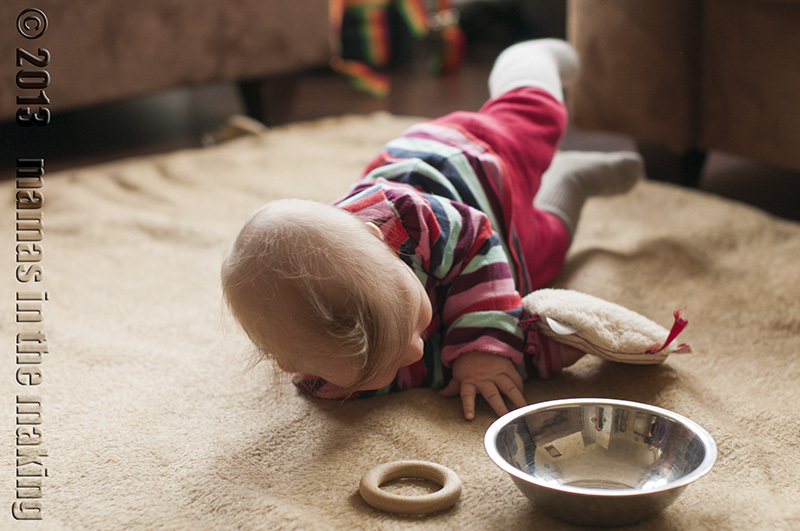 This tiny (in our eyes) struggle to reach a toy, to roll over, to get out from under the chair is exactly the level of struggle our kids are designed to endure… and overcome. The older we grow, the bigger the struggles in front of us. But maybe, just maybe, if we were allowed to experience the tiniest of struggles in the beginning of our adventure on Earth, we can move on and be prepared to face it all with courage, dignity and the ability to get up and go on when YOU are ready. In those first moments of struggle if we are present, if we manage not to take it all away, we are teaching our kids a very powerful lesson – that struggle is not bad, it’s not good, it just is. And maybe we are preparing them for a wonderfully full life, when once they fly out from our homes they will be ready to face the world with all its bruises and laughs. Because we didn’t take it all away when they were oh so tiny – but because we were there with them, right there on the floor, crying with them and picking them up, but not taking their struggles away. Whose struggle is it, anyway? Why do we struggle when our child struggles? Struggle equals emotions, and so we have to face not only our child’s emotions, but also our own. Our own emotions that have to do with our child’s cries, discomfort, but also our own emotions about the way WE struggle… or choose not to. Part of our struggle as an adult is that we know the big picture. We know what we could achieve and if we don‘t, if we struggle, we are upset and it‘s hard to deal with it. We see three steps ahead but often we oversee the power of the moment. If we step in too quickly in the moment of struggle, if we give them the last push to rolling over, hand them the toy their tiny arms can‘t reach we don‘t just help the butterfly leave the cocoon. We send another message that says: “This now is not it. See over there, behind those big mountains? This is the world. This is where you should be.“ And we take their ability to live right now. In this very moment. And then, the bigger the struggles are, the higher the mountains become. And we become frustrated. We oversee the small hills in between. We aim for the big ones, we run, jump and… we might fall, because we have underestimated the distance between here and now. We do this once, twice. And then… Well, we suppose most of you know what‘s next. We give up. We‘re fearful. Avoiding. And we can‘t deal with that either. Because we weren‘t able to deal with the small hills. So, to support our sons and daughters, we have chosen to let them struggle. We don’t walk away leaving them there, we don’t turn our heads, but we also don’t take it away from them. We try to empower them by being there, by making sure they have us right there when they need us, by being their rock and their tree. We let them get out of their cocoons “on their own, with our help”, in the hope that their beautiful wings will take them up when they’re ready. How do you cope with your child’s struugles? What helps you believe that they can do it? We LOVE to hear from you! First of all, let us clarify this: we are not suggesting that children should be left alone to figure out the world, without our help, assistance and presence. Even in play, it is great if we can be around to observe and help when needed. If we can be present, we can then be invited to participate and follow our child’s lead, making sure that the game is their, not our, invention. But then again – do children need our guidance in figuring out the rules of this daily game of life? Sure. Do they need our modeling of certain socially acceptable behaviors, and our help in acquiring them? Of course. But does this mean we need to do all of this guiding, teaching and modeling while they are engrossed in play? We think not. Even with very small babies there are plentiful other opportunities that will allow us to do all that guiding, teaching and modelling, and yet leave their play to them. If we allow ourselves to see all those moments, we can then happily sit back and observe how they spread the wings of their imagination, and let the cup be a flying saucer, a turtle, or their best friend. 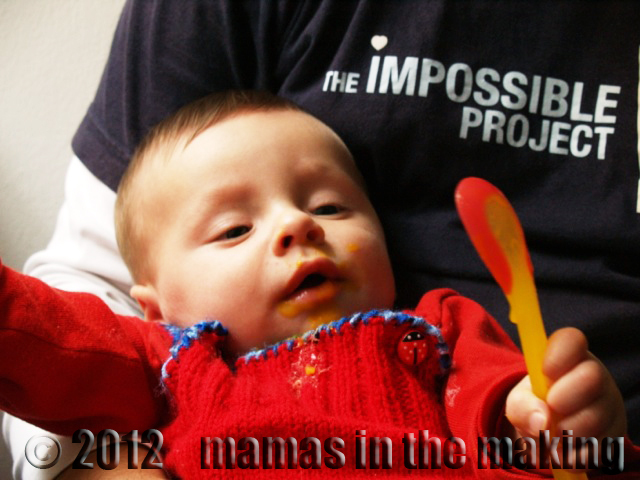 We believe that the moments of care (feeding, dressing, changing etc.) are those times when we can ask for collaboration and lead, while playtime is the time when we can step back and follow. This allows us and our children to have the balance we want (and need). To connect in times when we need to be there. To guide and model, and ask for cooperation. To teach the rules of the game. But at the same time, play remains play. No hidden agendas, no teaching language, social skills, or numbers, no jumping the line. All too often we try to rush through moments of care in order to engage with our children in play. And all too often we want to be so engaged in our children’s play that it might become our play, or that play changes into fulfilling our agendas (like teaching words, letters, numbers etc.). If, however, we choose to see moments of care as equally valuable to all the other moments when we can be with our children, they provide a world of opportunities for all this guiding and teaching we want to do. It is in our nature to want to teach, and want to share what we know. In other words, we can give them roots. If we do all that, or maybe if we realize that we are already doing all of that, perhaps the pressure will lift and we can give the babies back their sacred time of play. We will no longer feel the need to teach, lead, model and guide when they play – we are already doing all that in times of care, in those times that are equally valuable, and that provide us with endless opportunities to do just that. So, is there anything we need to do when our children play? Yes – be there. In other words, we can give them wings. So yes, we don’t think children need our guidance or our teaching when they play. They need our presence. What do you think? We LOVE to hear your thoughts! A recent article reporting a study on children’s response to directiveness of mothers in play (among other things) is here. ‘Ten commandments of play based learning’ from Emily at Abundant Life Children is here. Over the past few weeks we have been having conversations with lots of people about what it really means to play freely, and what free play is. And why it’s so important. And how to make sure our babies get lots of it. And maybe that we get some ourselves. And why… Can you tell this is one of our favourite things to talk and write about? It is self-initiated. Humans have the innate need to play. Babies seem to know what they want to play with, how they want to go about it, and what challenges they are ready for. Self-initiated play means allowing the baby to start their own play in their own way. Without suggesting the toys, placing a new rattle in their tiny hand. Sounds easier than it is done, and we have found this one to be particularly hard for a lot of people, especially parents of newborns and small infants – we often, almost intuitively, want to entertain, to provide, to suggest and to offer toys. If instead we let our babies explore on their own, we can find that what they see as play is not what we would do at all – but we can so easily get drawn into their incredible world of discovery. It is self-directed. When a toddler runs to us with a cup in his hand, it is nearly impossible (Anna still learning this one!!!) not to jump up and say: ‘Oh, are we having tea?’ But maybe we’re not having tea. Maybe that cup is a flying saucer, or a duck (that’s right! ), or maybe he was running to you to tell you he knows what colour it is. Here is the time to explore one of the many ways to use the magical parenting word: wait. Wait and see what happens. Wait for the discovery that your child is making right now to happen, and the joy to appear on his face. Wait for his ideas (not yours) to flourish one after another. Join in and follow, but try not to lead. Be the cast, not the director. It is self-paced. When enough is enough, let it be. Try not to encourage one more try to reach that ball, one more stretch. Babies know how to set their challenges, and in time they will learn to pick their battles, and learn how important it is to know what they can and cannot do. And when. When it’s nearly time to go and they are still engrossed in play, warn them in time, so they are given a chance to finish. If play is self-initiated, babies have a chance to discover the world at their pace. They know their bodies and their interests at any given stage better than we do – after all, they get to live with them. And by letting them choose their own play (even if sometimes we are not sure what it is they are doing, and feel like we would have a better idea of what to put on top of that basket… you know what I’m talking about :)), we are watching as they learn all about their own interests, passions, about the world around, their bodies and set up new and exciting challenges for themselves. If play is self-directed, our kids have a chance to learn about their own interests, but also limitations. They are able to explore their imagination to its fullest, without us giving them ideas and guessing what it is they are trying to do. They are given a chance to surprise us. Mama Nadine just had her little baby Mona two weeks ago, and she is once again discovering the joys of watching a newborn play :) How do your babies play? What is their favourite thing to observe, explore, attempt to do right now? We LOVE to hear from you! The other day I was at the playground with Leander who had just started enjoying the slides. 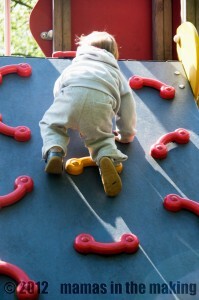 So he was busy climbing up the frames or walking up the slides. At some point I watched a woman standing behind him, holding her hands to protect him – my son – from falling down. When he was up there safely she walked around and stood at the bottom of the slides – to “catch” him. As I was just somewhere between stunned and surprised I didn’t say anything, just watched her. Leander went down the slide and she helped him get off. While she did so her own son – age 6 or 7 – climbed up the frame. Slipped. And fell to the ground. It was a very strange scene to watch. And obviously it did lead to the conclusion that this mother has – with the same behaviour she exhibited towards Leander – saved her own son from taking risks and – in the end – led him to experience such accidents later. If we are always around, surround our kids with the safety of our hands and arms and hinder any fall – they will not learn to estimate heights and distances, risks and what they are capable of doing. And what not. When in a new situation, they will look to us for help. But what if we’re not there to save them? And of course, we cannot always be. This does of course not mean we let our children run around and not care at all. Streets are dangerous. Stairs too. Here our gentle guidance is inevitable. There is a middle ground between too much control, and none at all – even though in the media (and on some parenting forums!) it would appear that our choices are ‘white’ or ‘black’, ‘helicopter’ or ‘neglect’, ‘authoritarian’ or ‘permissive’, there are in fact a million shades of grey in between. We believe the same is true for risky play. So all we have to do is to provide a safe play area for kids to explore. In the house, but also outside. We try to choose playgrounds that are made for children our age; use a stroller for long distances along big roads; provide a safe area in which our boys are free to explore. Because only then, once they are free to explore without our constant worry or our ‘saving’ arms, they are free to really learn. And this is when we can step back and learn to trust. The head to floor distance grows as the children grow and develop. First it is tiny, there might be a bang on the floor when they hit it for the first time, and of course this upsets them (and us!). But if we gently observe and explain, we will see that the second, maybe third time there is indeed… no bang at all. We will be left to admire how skilfully our child has figured out how to support his head, so he doesn’t hit the floor. How they gently pull the shoulder backwards, work those neck muscles, lift the head a bit higher, hold it at just the right height – this is truly art. And to know your own body so well is empowering, and so it gives them courage and confidence to move to the next step. So the earlier we start letting them learn to fall, the earlier we can learn to trust them. And allow them to learn to trust themselves – what a great gift to give, don’t you think? First step in an unknown situation is usually: Do I WANT to try this? Do I want to climb up there at all? In other words – Am I ready? And we can’t know if our child is ready – only the child knows that. Only he knows if he has the courage, ability, strength and will to try this thing he’s never tried, and only he knows if he can try it right now. You see many parents arriving at the playground, lifting their kids out of the stroller and leading them around the space. “Come on, let‘s slide. It‘s fun!“ Without even once asking the child if she wants to. When letting your child choose for themselves they might not look at the slide for a long time. This was the case with both of our boys – long looks in the direction of the slide, but no clear sign that they feel they want to go ahead. And then, one day, they walk over and have a closer look. Often the steps up are much more interesting than the slide down. So they start climbing up. If the steps are small enough for them they might go up all the way. If the space between steps is too high, they might try and try. Might struggle and complain. Or simply step back down. All of this is ok and part of the process. Part of learning what they are capable of. And what not. We shouldn‘t talk them into doing it. All we can do is narrating. ‘I see you want to go all the way up there.’ Quite often this is enough. No need to comment that it‘s too high, they are too small or “not ready yet.“ All of this would discourage them and judge their capabilities that – seriously – we quite often underestimate. More often than not they know better than we do what they are and are not capable of doing. If the child comes back down – we don‘t need to comment on that. Because she just went back to her own safety zone – she knew what she needed to do to feel safe again. If she won‘t come down but starts to cry or complain you can continue to narrate: ‘You are trying really hard to get up there. I see that.‘ And at some point she will ask for help or we offer help by asking: ‘Do you need my help?’ Usually they want help that moves them up. But that‘s not help, that‘s dangerous. Because this is jumping developmental steps – she will be higher than she can get to herself, which means she will have no idea how high she really is. And you will have taken away from the success that is yet to come and be her own – climbing all the way up by herself. Because surely, sooner or later, she will get there. When she is ready. Simply take her down and explain: ‘I will take you back down now because you got stuck.‘ And then see if she wants to try again or run off and do something else. Imagine you climbed a really long ladder to paint the walls in your house. You are up there and suddenly you feel unsafe. You want to come down but the whole thing is shaking. Your legs are shaking and you are scared of bending down because the ladder could fall under the shift of weight. Down at the bottom of the stairs you see your partner, who says: ‘Just take your right foot one step down.‘ and grabs it. Don‘t you want to yell at him ‘I can‘t! It‘s too shaky!‘ and at the same time shake off his hand from your foot? Because from the safety down there on the ground this person can‘t possibly feel the fear you are going through up there. And even if he can – he would certainly do things differently on the way down. He might take the right foot first, you‘d prefer the left. He might take two steps at once. You want to go one step at a time. Always starting with the left. Very slowly. He might jump the last 3 steps. You will not relax until you are down on the floor. If a child is allowed to climb up somewhere on his own once he is ready for it, he will find his way of getting back down at some point too. Until then – we do not guide. Not explain what to do. We‘ll simply offer help and take them back DOWN. So the golden rule is to let them explore without leaving them alone. To be there but not in their way. To watch and observe without distracting them. Our balance is partly situated in our inner ear. ‘Balance is a choreographed arrangement that takes sensory information from a variety of organs and integrates it to tell the body where it is in related to gravity and the earth.’ (http://www.medicinenet.com/script/main/art.asp?articlekey=21685). Balance is a combination of what the work done by your ears, your eyes and your brain. It is our inner instinct to shout and yell “Be careful!“ or “Watch out!“ But it‘s exactly these moments when children do fall. Because at that very moment they stop being careful. Because they heard us shout and turned their heads and attention towards us and away from what they were carefully doing. Because we are taking away the attention of their ear, which should at that moment be busy balancing. The more you watch your child carefully the more you will learn that in fact he is taking care of himself. So don‘t just step back and let them be. Watch from a distance. Surround them with trust and jump in when they do fall. Help them out of a difficult situation when they ask you to. Learning to assess risk is learning to judge reality; it is learning what we can and cannot do; it is, above all, learning what to do in a situation when we don’t know what to do. This is a great skill, one that is useful in just about everything we can think of. Knowing how to look at dangerous situations and figuring out what to do to stay safe is definitely something we want our children to learn. Knowing when it is worth making that extra step to the other side might be one of the things that will determine how they fare in life. Essentially, knowing how to take risks means also knowing how to stay safe… most of the time. After all – sometimes risking in life is exactly what allows us to go where we need to go, and maybe find our own path. Sometimes the internet does not seem the perfect invention when being a parent. There are too many decisions that have to come from within you and your family. Starting the weaning process is one of them. There is the when, what and how. And many many more questions you surely did not think of before giving birth to your little baby. And then there is us – mothers – with our own thoughts, feelings, fears and worries, that emerge every time we face a new phase, a new challenge, a new step ahead. Weaning is just another one of them. Both of us mostly breastfed our boys, but regardless of what decision you made in the first months, there comes the day – dreaded or long-awaited – when milk is not the main meal anymore, and when the time comes to move on to something else. There is a moment when you start thinking about it for the first time, and you realize (perhaps) that the number of questions you had in mind is nothing compared to the number of possible answers, and the amount of information about everything that is to do with weaning: when to start? what to give? how often? cow’s milk? gluten? fruit or vegatables? iron supplements? The old-school version (at least how we know it) said wait until 6 months, then slowly start with one small meal a day and see how it goes. This, as far as we’re concerned, is about enough to know about weaning (if your baby is healthy and does not have any allergies). But, unfortunately, both of us also love the question and answer game. And finding information. More often than not, it is useful, good, and once you get the hang of where to look you’re fine. But that, very often, is not a calm and collected way in which new mums look for information, especially not online. Ask your doctor, if you have one, or a nurse. Aks your friends. Look fort he information you need once. And then just move on – you have what it takes. And you have all you need. So of course, there is the 6 months mark. But then there are new studies coming in. And of course there is also Annabel Karmel or any other influential celebrity of choice. When Leander was about 3-4 months old a new study was published that suggested to start weaning at the age of 4 months already in order to avoid the risk of allergies. Before that all I heard was that breast- or bottlefeeding until the age of 6 months would be best for the child. Mothers. Pediatricians. Midwifes. And everybody else who thought to know all about it led long and painful discussions about what is best for a little baby‘s long term health. What we tend to forget is – every child is different. When we speak about gross motor development or play this all seems logical to us. But why should it be different when it comes to food? So how can we listen to a university professor who wants to tell us that we should do it this way or that? And the pediatrician, who looks at hundreds of little kids in a week, how could he know that our child is ready? Or not? It is dificult to know when your baby is ready, the overall general guidelines are helpful. But YOU are the one who knows your child. And also YOU are the one who knows yourself. Weaning is the beginning of another part of the journey. For some of us it is easy, for some it comes with a feeling of loss and fear. The most important thing we learnt – trust yourself, and remember you are weaning your baby but also… yourself. Give it time. Roughly around the time when most of the health guidelines suggest, but don’t be too strict – every baby is different, it does not have to be on the day your baby turns 6 months. Don’t prepare a feast only to later be disappointed that your baby is not keen to try the new wonderful thing you have so lovingly prepared. Leave the amazing dishes for later, when she is so used to the taste of your kitchen she will really really appreciate it. Put the time into being with her, rather than in the kitchen. Make it simple – for you and for her. Once a day, small portions. Explain first. Maybe a day or two before you think you might start with the first meal. Tell your baby what will happen. Communicate. Show them the spoon, maybe the food. Next time, it won’t all be new and unfamiliar – making things familiar is a very important part of any change. Remember, you would want to know why the desk in your office looks different, and what happend to the coffee machine? Slowly. Very very slowly and patiently – it is a big change, allow it to happen rather than rush through it. Every day is different – one day mashed carrots will be great, the next they will be on the floor. That’s fine, don’t take it personally. It’s not about you, or the carrots. Leave them and next time try something else. Allow your baby to try somehting more than once so they can get used to the taste. But also – allow them to decide they don’t want something. Surely there are things you don’t like to eat. With a lot of love also for yourself. Giving up those precious moments when you snuggle together for feeding might be hard for some. Not for everybody, but a lot of us have felt this tiny tiny sadness that this is the beginning of the end of something, and there is no going back ( http://sydneysteiner.com/2012/07/01/let-him-live-his-life-a-weaning-story-of-loss-and-separation/ ). There are many moments like this along the way. Admit that you’re sad, or whatever feelings you have. All those feelings are fine. Admit, so that you can move on. We have felt it. Both in the beginning of weaning and in the end – the last moments, when you know these are the last breast- or bottle-moments for the two of you. Cry. Buy yourself chocolate. Go for a walk. Admit to whatever you’re feeling (guilt, sadness, relief – it’s all normal, natural, and it’s so good that you have these feelings, you are a wonderfully emotional human being! ), and get ready for the rest of the big adventure. But also – listen to yourself and your baby. If it‘s too hard for both of you – slow down. Starting the weaning process, starting to eat solid foods does not mean there is a deadline to be met to stop bottle- or breastfeeding. Give both of you the time you need. May it be months or even years. Maybe one of the problems we see with weaning or starting solids is the wording. In the English speaknig world it all relates to weaning your baby. Stopping the milk supply no matter if breast or bottle have been given. In the German speaking world it‘s called „starting solid food“ so it‘s all about your child finally eating instead of drinking. What if we call it a big transistion in your child‘s life? Where the aim is to make it as smooth and comfortable as possible. Not to replace morning, lunch or evening feeding session. Not to eat at the family table. But to go with the flow of nature, that milk at some point might not be enough, that interest in solid food grows and the path is a process. No handbook available. Only then can we go back to our inner feeling, observing our child and realising what he needs most right now. We should not forget – food is about relationship as well. The relationship with our own body. While eating we try to constantly listen to myself. Am I enjoying this taste? Is it too cold or too hot? Am I still hungry? We as adults have almost forgotten to eat like that. Our children haven‘t. This is a huge gift we can give them – the ability to listen to their bodies when eating. To Stop when they’re full, say no when they’ve had enough (surely we all want our babies to be able to do that once they’ve grown up). So when accompanying them during this big transition – there are more things to keep in mind than when and what. There is how and how much. And many many nuances in between. Is there anything you found particularly difficult when you started the weaning process? Or particularly helpful? Can’t wait to hear your thoughts!